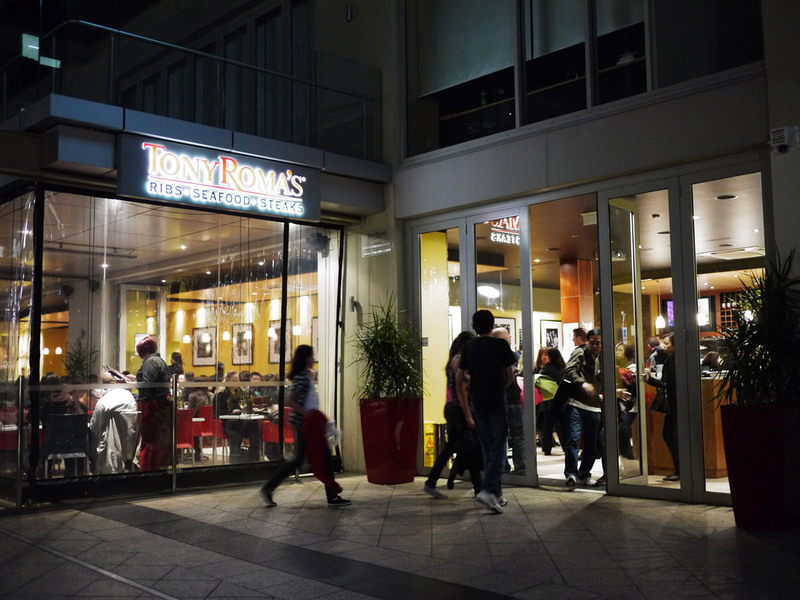 Tony Roma's...ah Ribs, Seafood and Steak. All else just fades away into the background in an almost psychedelic artwork manner. Where all senses and locomotion are sync to achieve just one: shamelessly enjoying a nice foot-long full slab of ribs. Fair warning for those who are on a strict regiment or have had one too many and are paying the price in your sunset years (no disrespect whatsoever to food veterans), the following contents will make you cry. Read on at your own risk. This mere sight of this culinary marvel can bring a big burly man on his knees. The glaze against the lighting of this fine establishment brings tears to even the the tin man, while the aroma of the meat from slow roasting can knock down the tallest of giants. What chance does an everyday Joe have against fighting the urges to ram into this delicious dish? None, and the long Que outside this joint is a testament to that. The already tenderest of cuts was roasted to perfection, with the meat coming off clean from the bones. The earthy aroma infused with a slight herby taste is married to the soury barbeque sauce. One would be forgiven to leave the cutlery unused, as it is almost a waste to ignore that unrefined caveman instinct boiling in you. You are also spoilt for choices when it comes to sides, chips, coleslaw, whole corn on a cob, mashed potato, baked potato. Just ask your kind server, what they have, and they are more than happy to oblige. Another nice combo to choose is the pork ribs and grilled prawns ($38.50). The prawns are lightly grilled to leave a slight woody aroma, while still maintaining that sweetness and juiciness, a mark of fresh ingredients, certainly. If you'd rather go all out beef tonight, then Tony have just the right menu for you. The source of the beef are only grain fed, to give the best tasting beef there is, you can choose different toppings for your steak such as mushroom sauce, caramalised onions, bleu cheese crust, pepper sauce, cabernet demi-glaze, dijon mustard and balsamic reduction. With so many toppings too choose from then the best option is to go for Beef fillet medallions, that comes in 3 cuts, and all come in different steak toppings. Lastly this fine dinner was made possible with the kind gesture of Lawrence and Michelle, as well as the wonderful accompaniment of old friends, Hayden and Caroline.